In SQL 2012 if your model database is set to SIMPLE recovery and you create a new user database you expect the recovery model of the user database to be automatically set to SIMPLE. In fact, sp_helpdb and the sys.databases reports that the recovery model is SIMPLE. However, if you backup the database and then backup the transaction log you’ll be surprised that the last action succeeds. If you do this in earlier SQL versions the backup log reports an error stating that such an operation is not permitted for databases with SIMPLE recovery model. Typically for development servers you’d set model to SIMPLE. Databases which have inherited this recovery model will show ever increasing transaction log files. If you manually CHECKPOINT such databases you should observe that the log space used never decreases. One workaround is to manually toggle the recovery model. That is, use the ALTER DATABASE to set it to FULL and then run it again but this time set it to SIMPLE. Are key and RID level locks always acquired ? Faced with the task of identifying the rows that are most frequently selected from a table, one possible solution was to use the lock_acquired extended event. 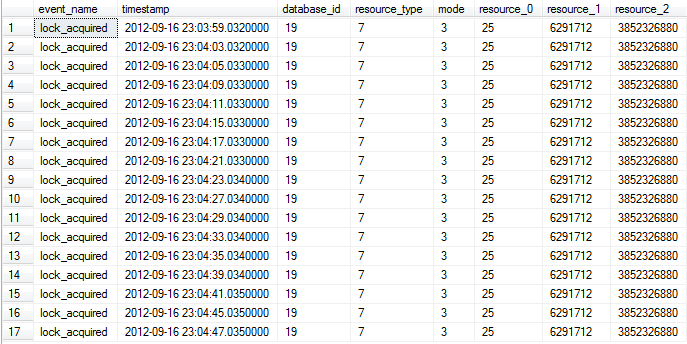 Using predicates based on the event columns it would be possible to filter on the database id, the lock mode (3 = Share) and the lock resource type (7 = KEY). With the extended event in place it was a surprise to find that a simple select with a where clause specifying the clustered primary key value (an identity column) resulted in no events being captured. Removing the predicates for the lock mode and lock resource type resulted in the appearance of an intent share lock for the object and an intent share lock for the data page. To check that this wasn’t an issue for extended events a sql trace on the lock event was set up and the same select scenario captured. Again, the intent share locks for the object and data page level showed up but no key level lock. It was only until another concurrent process was run which updated other rows on the same data page did the share key lock appear for the process that was selecting from the table. The conclusion is that for the default read committed transaction isolation level the finest grained locks at the data level are only requested if the same data page is at the same time being updated by another process. If a data page is not being updated it appears that the finest grained locks are not requested. This seems to make sense from a resource usage point of key (minimises the number of key level locks). The lock escalation event has been included but no output for this event will show up. The same scenarios were run for the primary key declared as nonclustered. For this case with just the select running for id 96 a share key lock was observed for index 2 but no share RID lock was observed. Just as for the clustered primary key case, the share RID lock appeared when the other concurrent process was updating another row on the same data page. 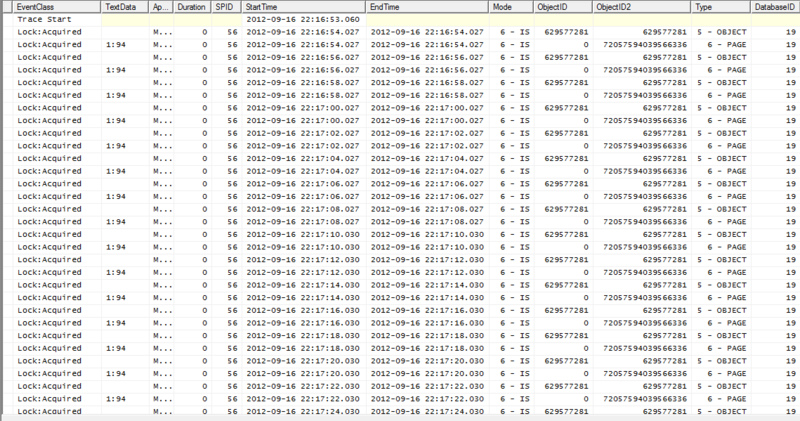 The result, (6000e0d79de5)/72057594039566336, matches the SQL trace details.